Methods for the algebraic specification of abstract data types were proposed in the early 1970s in the USA and Canada and became a major research issue in Europe shortly afterwards. Since then the algebraic approach has come to play a central role in research on formal specification and development, as its range of applications was extended to the specification of complete software systems, to the formal description of the program development process, and to the uniform definition of syntax and semantics of programming languages. Today this approach extends beyond just software to the development of integrated hardware and software systems. These flourishing activities in the area of algebraic specifications have led to an abundance of approaches, theories and concepts, which have universal algebra, category theory and logic as a common mathematical basis. 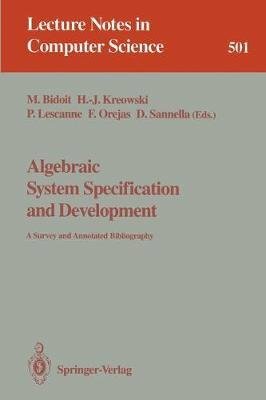 This volume is an annotated bibliography which provides an up-to-date overview of past and present work on algebraic specification. No attempt is made to provide a coherent introduction to the topic for beginners; the intention is rather to provide a guide to the current literature for researchers in algebraic specification and neighboring fields. Some indications of how the different approaches are related are included, together with some ideas concerning possible future directions.